Summary: A new study pinpoints the brain area responsible for forming direct links between environmental stimuli and enhanced focus. Researchers pinpoint brain structure that links environmental cues to enhanced focus. For a long time, brain scientists believed that maintaining focus in these situations required a cascade of mental events: momentary distraction, followed by the realization that our attention has been diverted and a conscious effort to bring it back on the task at hand. But recent research shows that our brains actually have a clever mechanism for outwitting these distractions. With repeated practice, environmental cues — such as a particularly busy intersection, or your boss’s office — can trigger the brain to jump directly into a more focused state, bypassing distraction and saving precious time. In a new study, Duke University researchers combined brain imaging with a celebrity naming game to pinpoint the structure in the brain responsible for forming direct links between environmental stimuli and enhanced focus. This structure, called the caudate nucleus, is also known to play an important role in linking motor actions to their consequences. The brain’s ability to automatically trigger greater focus was first demonstrated in 2011, and little is understood about how it handles this process, said senior author Tobias Egner, associate professor of psychology and neuroscience at Duke. To unravel the neural mechanisms involved, Egner and postdoctoral researcher Yu-Chin Chiu asked research subjects to carry out a variation on a classic test of mental control, called the Stroop test, while their brain activity was monitored with functional magnetic resonance imaging (fMRI). In a twist on the test, the 28 participants were shown a series of images of famous Hollywood men, including Brad Pitt, Tom Cruise, Matt Damon and Leonardo DiCaprio, and asked to identify each actor as quickly as they could. To make the task more challenging, written names appeared across each actors’ faces in bold red ink, and the name and photo correctly matched only half of the time. People usually take longer to respond when the names and the photos don’t match, Egner said, because they have to overcome their initial impulse to read the name and instead direct their full focus on the face. 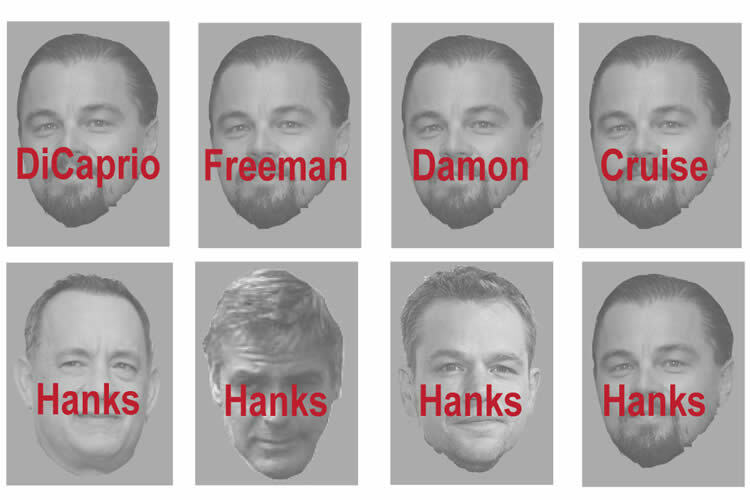 But the researchers found that if they frequently paired a specific face with incorrect names — for example, Leonardo DiCaprio’s face with the names Pitt, Cruise, or Damon — participants became better at identifying the face and ignoring the names. Since there is no way of knowing in advance which face will appear, or if the name will match, the only way to get faster is if the face itself directly triggers the brain to focus on the face and ignore the name, said Egner, who is also a member of Duke’s Institute for Brain Sciences. “If 75% of the time Leonardo DiCaprio appears with other people’s names, you learn that when you see DiCaprio’s face, you should ignore the distracting word,” Egner said. In a test of cognitive control, researchers found that repeatedly pairing a specific face, such as this photo of Leonardo DiCaprio, with the wrong name primed participants to focus entirely on the face when identifying the person in the image. NeuroscienceNews.com image is adapted from the Duke press release. As the research subjects learned to associate specific faces with a greater focus, fMRI scans showed a structure called the caudate nucleus lighting up. The results highlight how the brain’s ability to form well-learned, reflexive reactions — like reaching for the phone when it buzzes — is not always at odds with controlled, or intentional behavior, and in fact the two processes can actually work together. Funding: This research was supported by the National Institute of Mental Health (R01 MH 087610). Image Source: NeuroscienceNews.com image is adapted from the Duke University press release. Duke University “Triggering the Brain’s Auto Focus.” NeuroscienceNews. NeuroscienceNews, 25 January 2017. Duke University “Triggering the Brain’s Auto Focus.” http://neurosciencenews.com/enahnced-focus-neuroscience-6007/ (accessed January 25, 2017). A longstanding dichotomy in cognitive psychology and neuroscience pits controlled, top-down driven behavior against associative, bottom-up driven behavior, where cognitive control processes allow us to override well-learned stimulus–response (S–R) associations. By contrast, some previous studies have raised the intriguing possibility of an integration between associative and controlled processing in the form of stimulus–control state (S–C) associations, the learned linkage of specific stimuli to particular control states, such as high attentional selectivity. The neural machinery mediating S–C learning remains poorly understood, however. Here, we combined human functional magnetic resonance imaging (fMRI) with a previously developed Stroop protocol that allowed us to dissociate reductions in Stroop interference based on S–R learning from those based on S–C learning. We modeled subjects’ acquisition of S–C and S–R associations using an associative learning model and then used trial-by-trial S–C and S–R prediction error (PE) estimates in model-based behavioral and fMRI analyses. We found that PE estimates derived from S–C and S–R associations accounted for the reductions in behavioral Stroop interference effects in the S–C and S–R learning conditions, respectively. Moreover, model-based fMRI analyses identified the caudate nucleus as the key structure involved in selectively updating stimulus–control state associations. Complementary analyses also revealed a greater reliance on parietal cortex when using the learned S–R versus S–C associations to minimize Stroop interference. These results support the emerging view that generalizable control states can become associated with specific bottom-up cues, and they place the caudate nucleus of the dorsal striatum at the center of the neural stimulus–control learning machinery. SIGNIFICANCE STATEMENT Previous behavioral studies have demonstrated that control states, for instance, heightened attentional selectivity, can become directly associated with, and subsequently retrieved by, particular stimuli, thus breaking down the traditional dichotomy between top-down and bottom-up driven behavior. However, the neural mechanisms underlying this type of stimulus–control learning remain poorly understood. We therefore combined noninvasive human neuroimaging with a task that allowed us to dissociate the acquisition of stimulus–control associations from that of stimulus–response associations. The results revealed the caudate nucleus as the key brain structure involved in selectively driving stimulus–control learning. These data represent the first identification of the neural mechanisms of stimulus-specific control associations, and they significantly extend current conceptions of the type of learning processes mediated by the caudate.